SOUTHINGTON - All it took was some rose-hued icing and Megan Spahic’s patient hand to turn a rainy, dreary Sunday into a sweet, enlightening one. 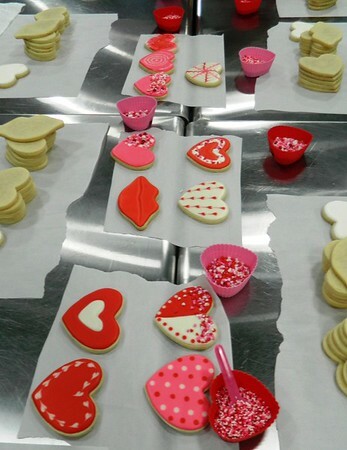 The Southington resident and budding pastry chef taught 10 people the art of cookie decorating inside Foodology Cooking School & Bakery Café at 991 S. Main St. At the end of the lesson students went home with a dozen treats each, gifts for loved ones this Valentine’s Day. 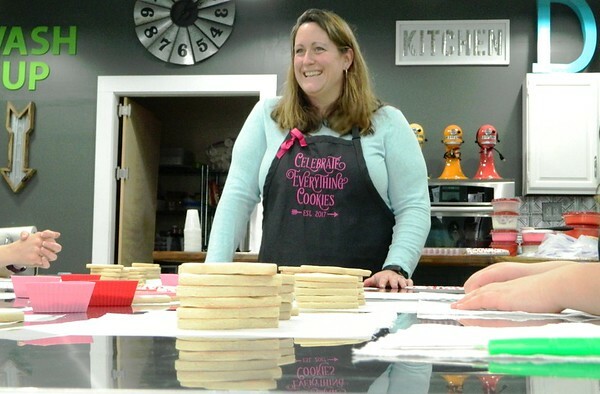 It was the first time teaching cookie artistry for Spahic, who works as a physical education teacher at a middle school in Hamden. 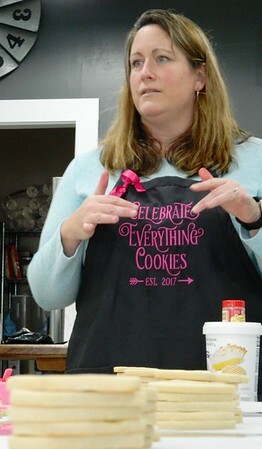 “I’m still learning as I go along,” she said, wearing an apron with the words “Celebrate Everything Cookies” - the name of her recently formed cookie venture. Right now she takes small orders from friends and family, but she’s hoping to rent space in the near future and turn the hobby into a career. Amy Becker sat just around the corner of the demonstration table from her longtime friend. “I’ve enjoyed Megan’s cookies for over a year now and I came so she could teach me how to make them,” said Becker, who lives in Stamford. Her mother, Marie Ferreira, of Cheshire, also took part. Spahic began with some basic tips, like the importance of refrigerating dough for an hour before turning it into cookies. Stores like Joann Fabrics and Michaels sell icing tips and piping bags, Spahic told the group, along with food coloring and cookie molds. She learned this upon taking up the hobby about a year ago. “I went to a class and I liked it so much I decided to venture out on my own. Now I’m passing the knowledge onto others,” she said. 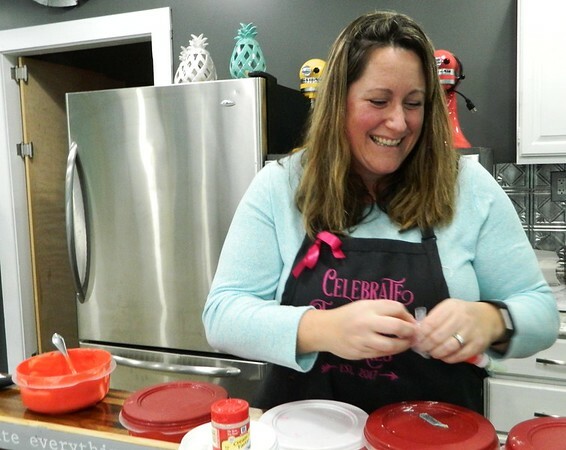 She developed a friendship with Foodology owner Christina Hart, who invited her to teach Sunday’s class. 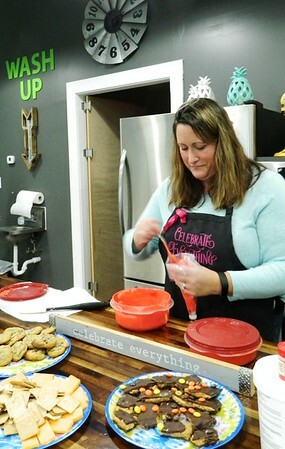 Hart started as a baker herself, before her cookies became so popular she was able open the doors to Foodology in July 2016. The company offers all types of cooking classes for all ages, along with fundraising opportunities for kids and team-building workshops for corporate groups. It’s also a popular venue for birthday parties, bridal and baby showers. Stephanie Marino, 12, and Olivia Greene, 11, are two of Spahic’s students in Hamden. 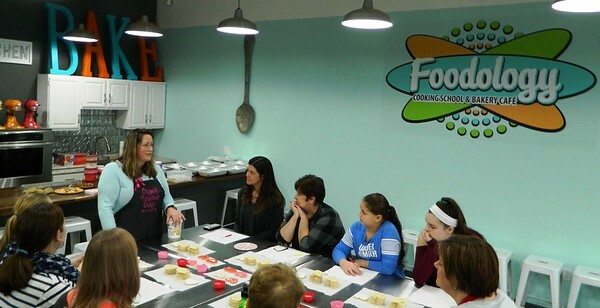 They were excited to spend time with their teacher inside Foodology’s kitchen. Earlier that morning another group took part in a thank-you letter writing workshop, with life coach Lucinda Testo from Unlimited You, LLC. Both events were sold out, as are the school’s remaining February classes. Hart is still taking sign-ups for March activities. The first is a baking challenge, Family Food Fight: Cupcake Wars, set for Sunday, March 11 from 12 to 2 p.m. Groups of two to four will compete for prizes, turning their own recipes into a dozen cupcakes to be judged by several guest chefs. Entrants are required to submit ingredient lists a week ahead of time and items will be provided by Foodology. Then, scheduled for Friday, March 16 is St. Paddy’s Day Cooking with Beer from 7 to 9 p.m. On the menu is Guinness-infused Irish stew, classic Irish soda bread and hand pies. Erica Schmitt can be reached at 860-801-5097, or eschmitt@centralctcommunications.com. Posted in New Britain Herald, , Southington Herald on Sunday, 11 February 2018 21:54. Updated: Sunday, 11 February 2018 21:56.